Get ready, I’m about to blow your mind with this Raw Chocolate Superfood Parfait. Did you know you can satisfy your sweet tooth and chocolate cravings with a raw vegan dessert that’s actually good for you? Well now you know! This Raw Chocolate Superfood Parfait is rich, creamy, chocolatey, and full of superfoods. YUM. Although this Parfait is quite healthy, it’s super rich. I can only eat a few bites at a time. So make this Raw Chocolate Superfood Parfait and invite some friends over to share it with! In a high powdered blender or food processor, combine the avocado, maple syrup and cacao powder. Blend for 2-3 minutes until smooth. 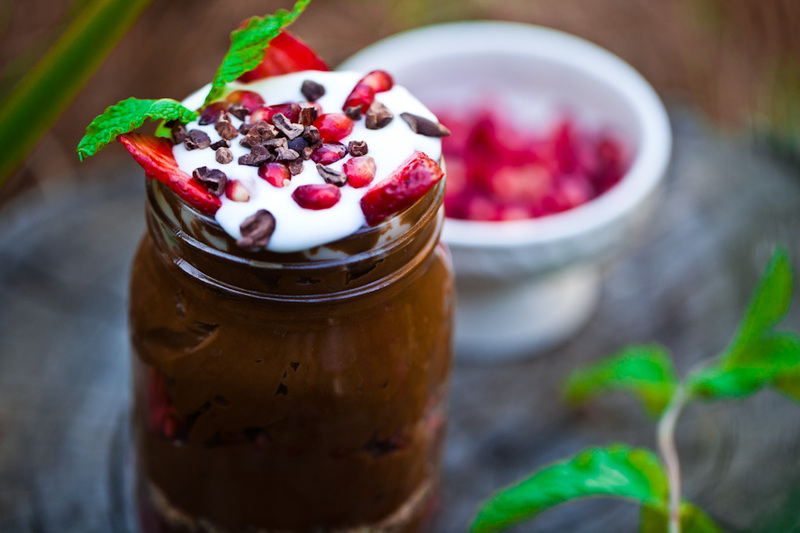 Divide the chocolate avocado pudding into two jars, alternating layers of pudding with the hemp seeds, cacao nibs, goji berries, strawberries, and pomegranate seeds. Top with a dollop of coconut cream and a sprinkle of cacao nibs. Notes: This makes 2 very generous portions. Leftovers will keep in the fridge for up to 3 days. For other tasty, healthy vegan desserts, check out our Raw Vegan Strawberry Cheesecake or our Raw Vegan Chocolate Shake!